Fibre-fortified beverages the next new mainstream trend? Using a straw instead of a spoon and fork may be the newest way to increase fibre intake. 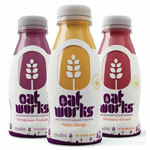 Juices, water, smoothies and sports drinks are some of the newest products supplying fibre, reports FoodProcessing.com. Food processors are working to bring the benefits of fibre to consumers in more and simpler ways. Coca-Cola and PepsiCo have each introduced soft drinks (Pepsi Special, below, introduced in Japan late 2012) with added fibre on the international market. More recently, Coca-Cola is seeking a patent for a sugar-free beverage with fibre. “While the fibre-fortified beverage market is still relatively small, beverage brands and manufacturers see a lot of opportunity for growth,” says Patrick Luchsinger, marketing manager for nutrition at Ingredion, Westchester, Ill.
“While the old idea of fibre in a beverage may still call to mind powdered drink mixes or thick, nutritional supplement-type drinks, advances in ingredient technology now enable beverage developers to add significant levels of fibre to a range of mainstream beverages,” he continues. Those “advances in ingredient technology” include Ingredion’s Nutraflora and Nutriose products. Nutraflora is a short-chain fructooligosaccharide, a natural prebiotic fibre derived from non-GMO beet or cane sugar. Nutriose is a soluble fibre of natural origin, derived from wheat and corn. “Functional beverages are already part of a healthy lifestyle, but consumers aren’t always aware of the health impact of different types of dietary fibre,” says Rhonda Witwer, head of nutrition communications at Beneo. “According to internal research by Ingredion, high-fibre diets are more popular now than low-fat or low-calorie diets, and there has been an increase of fibre intake over the past couple of years,” adds Ingredion’s Luchsinger. “This is a positive trend, as the average adult only eats 15g of fibre per day,” he said. The USDA recommended intake for total fibre for adults up to 50 years of age is 25g per day for women and 38g per day for men. For those over 50, the recommended intake is 21g for women and 30g for men. “Demand for all-natural is growing, as is the overall market for products that make people feel good about what they are consuming and help them feel well afterwards,” adds Witwer. The USDA’s food pyramid call for 2-4 servings of fruit, 3-5 servings of vegetables and 6-11 servings of cereal and grain foods. Following the guide will provide the 25-30g of daily fibre. Nobody said you couldn’t drink your way to the goal.